Gatwick Airport (/ˈɡætwɪk/), also known as London Gatwick (IATA: LGW, ICAO: EGKK), is a major international airport near Crawley in West Sussex, southeast England, 29.5 miles (47.5 km) south of Central London. 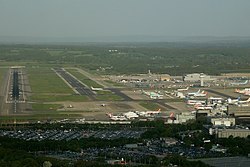 It is the second-busiest airport by total passenger traffic in the United Kingdom, after Heathrow Airport. Gatwick is the eighth-busiest airport in Europe. Until 2017, it was the busiest single-use runway airport in the world, covering a total area of 674 hectares (1,670 acres). The Civil Aviation Authority Safety Regulation Group is in Aviation House. WesternGeco, a geophysical services company, has its head office and Europe–Africa–Russia offices in Schlumberger House, a 124,000 sq ft (11,500 m2) building on the airport grounds near the South Terminal. The company had a 15-year lease on the building, scheduled to expire in June 2008. In 2007, WesternGeco reached an agreement with its landlord, BAA Lynton, extending its lease to 2016 at an initial rent of £2.1 million. Fastjet has its registered and head offices at Suite 2C in First Point at the airport. By 2008, Flybe was Gatwick's third-largest airline (accounting for 9% of its slots) and its fastest-growing airline. It became the airport's largest domestic operator, carrying 1.2 million passengers in its 2011–12 financial year on eight routes to destinations in the UK, the Channel Islands and the Isle of Man. [nb 6] In March 2013, the airline announced that it would end operations at Gatwick, citing unsustainably high airport charges and increases in UK Air Passenger Duty. Flybe sold its 25 pairs of daily slots[nb 8] at the airport to EasyJet for £20 million. The latter's share of Gatwick slots increased to 44% in summer 2014; second-placed BA has held about 16% of the airport's slots since 2010. Following the sale of its Gatwick slots to EasyJet, Flybe continues to provide the scheduled service between Gatwick and Newquay, as a result of being awarded the contract to fly this route under a four-year Public Service Obligation (PSO). 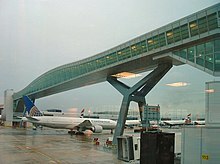 The EU–US Open Skies Agreement, which became effective on 30 March 2008, led a number of airlines to downsize their transatlantic operations at Gatwick in favour of Heathrow. Continental Airlines was the second transatlantic carrier (after American Airlines) to leave Gatwick after its decision to transfer the seasonal Cleveland service to Heathrow on 3 May 2009. Gatwick handled 186,172 passengers during its first seven months of operation after the 1956–58 reconstruction; the annual number of passengers passing through the airport was 368,000 in 1959 and 470,000 in 1960. Passenger numbers reached one million for the first time during the 1962–63 fiscal year,[nb 10] with British United Airways (BUA) accounting for four-fifths. The 1.5 million mark was exceeded for the first time during the 1966–67 fiscal year. [nb 11] This was also the first time more than half a million scheduled passengers used the airport. Gatwick accommodated two million passengers for the first time during the 1967–68 fiscal year[nb 12] and three million in the 1969–70 fiscal year,[nb 13] with BUA accounting for nearly half. By the early 1970s, 5 million passengers used Gatwick each year, with a record 5.7 million during the 1973–74 fiscal year. [nb 14] During that period, British Caledonian accounted for approximately half of all charter passengers and three-fourths of scheduled passengers. Within a decade annual passenger numbers doubled, to 10 million; they doubled again, to over 20 million, by the late 1980s. By the turn of the millennium, Gatwick handled more than 30 million passengers annually. 15 September 1936 – A British Airways Ltd de Havilland DH 86 on a night mail flight to Germany crashed on takeoff, killing the airline's chief pilot and two crew members. November 1936 – A British Airways Ltd Fokker F 12 crashed in a wood 4.5 miles (7.2 km) south of Gatwick on its final approach to the airport under a low ceiling in poor visibility, killing both pilots and seriously injuring the flight engineer. 17 February 1959 – A Turkish Airlines Vickers Viscount 794D (registration: TC-SEV) on an international charter flight crashed in heavy fog at Newdigate, Surrey, on its approach to Gatwick after striking trees. Fourteen of the 24 on board died, and Turkish Prime Minister Adnan Menderes was amongst the survivors. 5 January 1969 – A Boeing 727-113C (registration: YA-FAR) operating flight 701 of Ariana Afghan Airlines arriving from Frankfurt Airport, Germany, crashed into a house in Fernhill (near Horley, Surrey) in low visibility. The flaps were not extended to maintain flight at final-approach speed. Forty-eight of the 62 on board died, in addition to two on the ground. 28 January 1972 – A British Caledonian Vickers VC10-1109 (registration: G-ARTA) with no passengers aboard sustained severe structural damage as a result of a hard landing at Gatwick at the end of a short ferry flight from Heathrow, where the aircraft had been diverted due to fog at Gatwick. After touching down on runway 08 and applying spoilers and reverse thrust, the aircraft became airborne again, bounced twice and landed heavily. This resulted in a burst front wheel tyre, a separated wheel and a crumpled fuselage (immediately in front of and behind the wings). A survey of the aircraft's damage revealed that its airframe was bent out of shape, requiring extensive repairs to be restored to airworthiness. Since the repairs were not cost-effective, the airline's management decided to cannibalise the aircraft for spare parts before scrapping it at Gatwick in 1975. 20 July 1975 – A British Island Airways (BIA) Handley Page Dart Herald 201 (registration: G-APWF) was involved in a runway accident while departing on a scheduled flight to Guernsey. The aircraft lifted off from runway 26 after a ground run of 2,490 feet (760 m), and appeared airborne for 411 ft (125 m) (with its landing gear retracting), before the rear underside of the fuselage settled back onto the runway and brought the aircraft to a stop. An investigation concluded that the landing gear was retracted before the aircraft had become established in a climb and the flap setting and takeoff speed were incorrect. Although the aircraft incurred substantial damage, none of the 45 occupants were hurt. 19-21 December 2018 – Major disruption to the airport was caused by a drone flying near the runway, which was shut for about six hours on the 19th. The airport reopened at 03:01 the next morning until another sighting forced it to close again about 45 minutes later. As of 00:15 on the 21st, the airport was still closed with about 110,000 passengers and 760 flights affected. Officials called the drone flying a "deliberate act of disruption", but did not classify it as terrorism. The army were deployed to assist police in ending the incident. The runway reopened with limited capacity at around 06:00 on the 21st. There was another suspension of flights from 17:10 to 18:23 on the 21st. Later that day a man and a woman were arrested in connection with the incident; they were released without charge on 23 December with Sussex Police saying that they "are no longer suspects". ^ a b c "London Gatwick – EGKK". Nats-uk.ead-it.com. Retrieved 15 August 2010. ^ Smith, Oliver. "The statistics that show how Heathrow is losing its 'megahub' status". The Telegraph. Retrieved 31 December 2018. ^ Alan Powers (1992). In the Line of Development: FRS Yorke, E Rosenberg and CS Mardall to YRM, 1930–1992. RIBA Heinz Gallery. ISBN 1-872911-20-X. ^ "Braniff History – Braniff History Time Line: 1978". clippedb.org (The Association of Former Braniff Flight Attendants). Archived from the original on 2 June 2013. Retrieved 18 December 2012. ^ Christie, Jim (15 June 2010). "Calpers acquires 12.7 percent stake in Gatwick Airport". REUTERS—UK. Retrieved 15 August 2010. ^ Kollewe, Julia (27 December 2018). "Gatwick airport: majority stake sold to French group". The Guardian. ISSN 0261-3077. Retrieved 27 December 2018. ^ "French firm to control Gatwick Airport". BBC News. 27 December 2018. Retrieved 27 December 2018. ^ "V Room – The new Lounge at Gatwick". Virgin Atlantic. Retrieved 11 February 2014. ^ a b Eade, Christine. "The market in minutes – Sussex." Property Week. 8 June 2007. Retrieved 12 February 2011. ^ "Redefining airport hubs: (Self)-connectivity: the next vital piece in the industry's advancement – Gatwick Airport is another example where self-connection matters". CAPA Centre for Aviation. 29 May 2015. Retrieved 6 June 2015. ^ "History – 1958". Gatwick Aviation Society website. Retrieved 15 August 2010. ^ "NATS – London Gatwick Aerodrome Approach Charts". Nats-uk.ead-it.com. Retrieved 15 August 2010. ^ "Gatwick facts & stats – Destinations and airlines". Gatwick Airport. Archived from the original on 24 November 2012. Retrieved 30 November 2012. ^ "Norwegian Air part 1 – A second UK long haul base at Edinburgh. Matches Virgin on Gatwick-US seats: Gatwick still dominates Norwegian's UK operation (Table: London Gatwick Airport: airlines by share of international seats, week of 29-May-2017)". CAPA Centre for Aviation. 9 January 2017. Retrieved 9 January 2017. ^ a b "British Airways: the parental favourite gets new toys, but still has homework to do – BA's decline at Gatwick". CAPA Centre for Aviation. 24 May 2013. Retrieved 24 May 2013. ^ "Europe by EasyJet: 2012 Investor Day (Network Development and Optimisation: Strong slot position at key airports – Summer '12 Gatwick departures 0600-0855, p. 20)" (PDF). easyjet. 31 January 2012. Retrieved 4 February 2012. ^ "Flybe Group Annual Report 2011/12 – Business highlights: Airport policy, p. 9" (PDF). flybe.com. 11 June 2012. Retrieved 12 June 2012. ^ "EasyJet works the Gatwick slot machine as Flybe cashes out: Flybe has less than half the average number of passengers per ATM at Gatwick – Seats per ATM at London Gatwick". CAPA Centre for Aviation. 31 May 2013. Retrieved 31 May 2013. ^ "WestJet to Launch Service to London–Gatwick". Huffington Post Canada. 16 June 2015. Retrieved 18 June 2015. ^ "Air Canada Adds Lyon, London–Gatwick to its Growing Global Network". CNW Group. PR Newswire. 25 June 2015. Archived from the original on 26 June 2015. Retrieved 25 June 2015. ^ "Modern Airport – Features of Gatwick, London's Latest Terminal: Rational Building Layout: Ground and Air Traffic Control: Ancillary Services". Flight. 4 June 1936. p. 602. Retrieved 12 July 2011. ^ "Modern Airport – Features of Gatwick, ..." Flight. 4 June 1936. p. 603. Retrieved 12 July 2011. ^ "Modern Airport – Features of Gatwick, ..." Flight. 4 June 1936. p. 604. Retrieved 12 July 2011. ^ "British Caledonian – A Tribute: The Crewroom Notices". www.british-caledonian.com. 2 June 2012. Archived from the original on 18 April 2012. Retrieved 9 June 2012. ^ "London Gatwick service from late-Dec 2018". Routesonline. Retrieved 27 December 2018. ^ "easyJet launches Gatwick – Jerez de la Frontera & Zadar". London Air Travel. Wordpress.com. 13 December 2018. Retrieved 15 December 2018. ^ Thomas Cook Flights – Fly Thomas Cook Airlines. Thomascookairlines.com. Retrieved on 24 September 2017. ^ "Antalya – London/Gatwick (LGW) – Antalya flights are planned as 2 flights per week and will be launched as of April 04, 2019". Turkish Airlines. 12 December 2018. Retrieved 15 December 2018. ^ "Norwegian strengthens London Gatwick & Singapore Changi LCC hub position: long haul low cost Part 2 – Gatwick and Changi are both major LCC hubs". CAPA Centre for Aviation. 27 April 2017. Retrieved 29 April 2017. ^ House of Commons Transport Committee (February 2008). The Future of BAA: Fourth Report of Session 2007–08 (Report). The Stationery Office. Ev. 112. ISBN 978-0-215-51413-4. ^ "Press release 2010 – London Gatwick – we have lift on!" (Press release). Gatwick Airport. Archived from the original on 3 August 2010. Retrieved 15 August 2010. 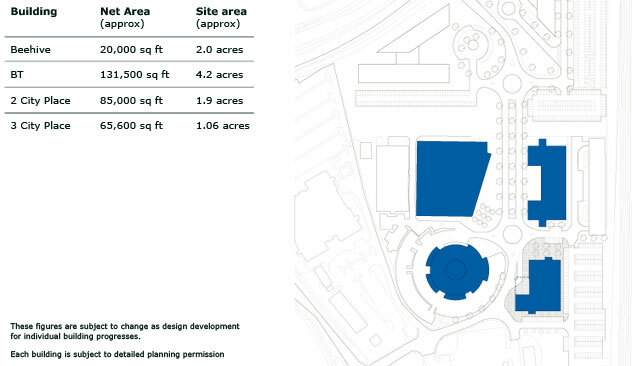 ^ a b "interim master plan (Gatwick Interim Master Plan – October 2006)" (PDF). 15 August 2010. Retrieved 15 August 2010. ^ "Ministry of Aviation – Civil Aircraft Accident: Report on the Accident to Vickers Viscount 794 TC-SEV at London (Gatwick) Airport on 17 February 1959". Gatwick Aviation Society. Archived from the original on 16 December 2007. Retrieved 15 August 2010. ^ "Accident Database query – Ariana Afghan Airlines". Airdisaster.com. 5 January 1969. Archived from the original on 11 August 2010. Retrieved 15 August 2010. ^ "Board of Trade – Civil Aircraft Accident: Report on the Accident to Boeing 727-113C YA-FAR 1.5 miles east of London (Gatwick) Airport on 5 January 1969". Gatwick Aviation Society. Retrieved 15 August 2010. ^ "A little 'VC10'derness—Individual Histories: G-ARTA". Vc10.net. Retrieved 15 August 2010. ^ "ASN Aircraft incident description Vickers VC-10-1109 G-ARTA—London Gatwick Airport (LGW)". Aviation-safety.net. Retrieved 15 August 2010. King, John, with Tait, Geoff, (1980) Golden Gatwick – 50 Years of Aviation, British Airports Authority. Branson, Richard (2006). Losing my Virginity – The Autobiography (2nd reprint ed.). London, UK: Virgin Books Ltd. ISBN 0-7535-1020-0. Skyport – Gatwick edition (Dixon, A., "Second runway plans to remain grounded", pp. 1, 3). Hounslow, UK. 26 February 2010.